How To Make The Most Of The Skye Terrier Temperament? 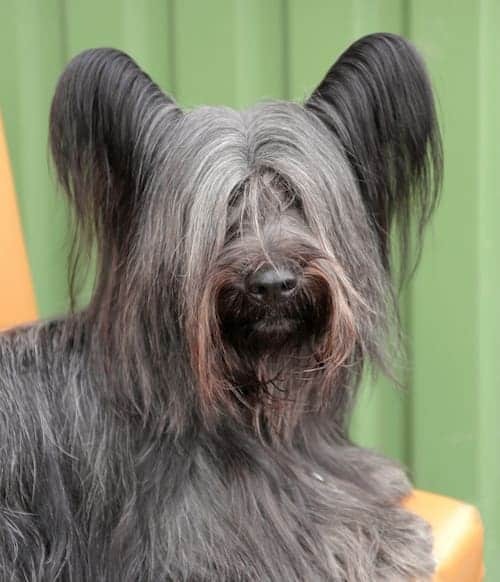 How To Make The Most Of The Skye Terrier Temperament (Intelligent, Fearless, Friendly)? 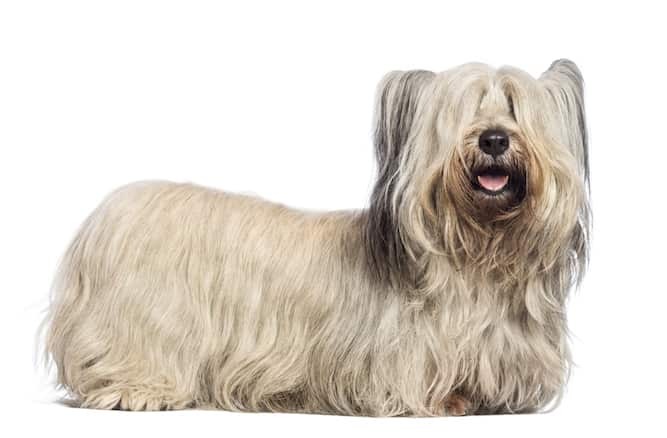 Bred to find and kill badgers, foxes, and otters on farms, the Skye Terrier temperament is loyal, good-tempered, and fearless. Hailing from the Isle of Skye in Scotland, Skye Terriers is an old breed. Queen Victoria was a fan of the breed. She bred and kept Skye Terriers and they eventually became one of the most popular terrier breeds. Today, the Skye Terrier enjoys life as a loving companion dog. The Skye Terrier dog is a classic Terrier – fearless yet friendly with people they know. They are clever and sensible as well as incredibly canny. True to the Terrier heritage, Skye Terriers are cautious and reserved around strangers. They tend to study humans carefully and only give affection to those they deem worthy. Once affection is given, it’s given for life. Thanks to their caution towards strangers, Skye Terriers make excellent watchdogs. Expect to know when an intruder is near with this breed! Skye Terriers are devoted to their humans and love to be part of everyday life. They will become unhappy and bored if they feel neglected. When if comes to children Skye Terriers are wonderful with older children when socialized properly but are too feisty for children under six. Skye Terriers may be aggressive towards unfamiliar dogs but will get along well with dogs and cats they are raised with. Because of their small size, Skye Terriers will adapt to any environment – from a country home to apartment life. Skye Terriers are intelligent but strong-willed. They aren’t as stubborn as other terriers and are open to training – provided it is a positive experience. Skye Terriers only respond to positive reinforcement – they withdraw from negative or harsh training. Make sure training sessions are filled with lots of praise and lots of treats. They are eager to please and love human interaction. But this is a breed that is reserved with strangers and should be socialized from a young age. When socialized properly, they will grow up to be a happy and outgoing adult. A great resource you should consult that has tons of dog training videos which provide expert advice is Doggy Dan's – The Online Dog Trainer. 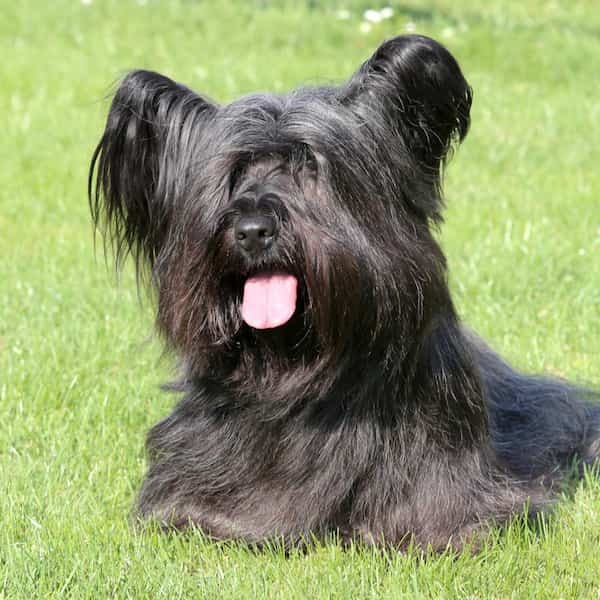 Ready to add a Skye Terrier to your family? You have a couple of options to find your perfect Skye Terrier. You can purchase a purebred Skye Terrier puppy from a breeder or, adopt one from a rescue organization. Skye Terrier puppies are a great option for families who want to raise a puppy – and have the time to do so. Puppies are cute, but they are hard work! If you don’t have time to raise a puppy, consider adopting an adult dog from a Skye Terrier rescue. Adults are far less time-consuming and often have a solid training foundation. Purebred Skye Terrier puppies for sale will cost between $700-$900. If you are looking for a puppy with a superior lineage, expect to pay closer to $900 or more. The Skye Terrier price depends on the breeder location, lineage, and litter availability. Skye Terriers for adoption will cost between $200-$500 depending on the rescue organization. If you decide Skye Terrier rescue is for you, the Skye Terrier Club of America is the perfect place to start. They have a rescue section where you can contact a member of the rescue committee if you are interested in adopting. Adopting an adult Skye Terrier is a great option for busy families who are short on time – meaning they don’t have time to raise a puppy! If you aren’t looking for a purebred but perhaps a mixed breed, your local animal shelter might have Skye Terrier mixes available for adoption. To find a Skye Terrier for sale from a breeder, your first stop should be the AKC Marketplace. They AKC Marketplace is a great search tool. You can search for breeders based on location, whether they have puppies available, and if they are of champion bloodlines. Take your time and do your research to find a breeder. Not all Skye Terrier breeders are reputable. Reputable breeders will be able to answer your questions, provide applicable health certificates, and treat their dogs and puppies with love and respect. It may take some time, but through research and home visits, you’ll find your ‘perfect' Skye Terrier! The Skye Terrier breed is known to be short, only standing at 9-10 inches tall. They weigh between 35-45 pounds and live between 12-14 years. 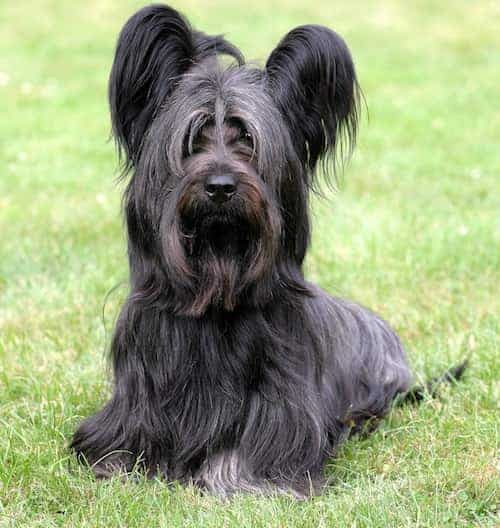 Skye Terriers have an elegant, stylish coat that flows straight down their sides with a middle part. Their undercoat is soft, short and wool-like while their outer coat has a hard texture. Their coat comes in black, blue, light or dark grey, silver, cream, or fawn. Skye Terriers require weekly brushing and a bath every two to three weeks to keep their coat clean. Because of their grooming requirements, some owners opt for a Skye Terrier short haircut. Note: Our Health is #1 Priority. It should be no different or your Skye Terrier. The Ultimate Guide to Dog Health is a handy guide that will help you recognize the symptoms of the health problems above (and others). Get the knowledge to stay ahead of these terrible issues that can rob your lovely Skye Terrier from vigor and life. Help your friend make it to the 14 yrs+ without pain and suffering. Skye Terriers require minimal exercise. They are typically content with whatever their owners are doing – such as a short daily walk or a quick game of fetch in the backyard. Skye Terriers also excel in dog sports such as agility and obedience. Conclusion: Why the Skye Terrier? The loyal, good-tempered, and fearless Skye Terrier is a devoted family companion. They do well in homes with older children and can be dog selective – especially if they are not raised with the other dogs. Because of their size and good nature, they adapt well to any environment. Skye Terriers have minimal exercise requirements, but they do need weekly grooming. If you are looking for a friendly, intelligent dog, the Skye Terrier is for you. Previous post: American Water Spaniel Temperament (Friendly, Energetic): Can You Keep Up?